Follow a path of leaves down a ‘secret garden’ alley to Studio #2, where ceramist Sharon Ho at Felt + Ceramics has a gem of a creative space in the heart of Eastsound, just beyond the (very real) temptations of Clever Cow Creamery. Here, Sharon gives rein to her whims and hand builds whatever comes to mind, be they live edged platters, pod like vessels, tiny shell dishes or intricate collaged sculptures to wear. The way the surfaces of hand pinched ceramic pieces so subtly catch and cast off light in all the places shaped by the artist’s hand is what keeps me hand building. I want my work to invite people to hold it in their hands and enjoy what they are using – that the vessel enhances an experience and is not merely a conveyance tool. Marine Gypsy necklace. Stoneware with Peruvian amazonite with stick pearls. To that end, Sharon textures and distresses the clay surface with needle tools to create a patina, age and hints of decay that define natural objects. It suggests a life lived with stories to tell. Isn’t that why a skeleton leaf or sun-bleached bones are desolately beautiful? And why antiques and vintage goods appeal to so many? In the classic children’s tale, The Velveteen Rabbit, the stuffed bunny is utterly ragged after years of being loved, and in the end, becomes real. 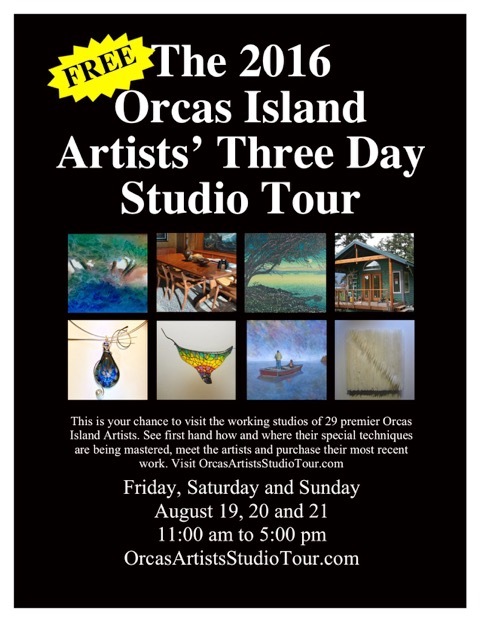 Located in Eastsound, in the middle of Orcas Island, this studio is an easy stop on the tour. Aptly, Sharon features her work online under Optimism and Co., and also on Facebook and Instagram. Note: The rights to the images published in this blog article belong to the artist/artists featured and these images may not be used or reproduced in any way or form without first obtaining clear written permission from the artist who owns the rights. To contact the artist directly, please go to http://www.orcasartistsstudiotour.com for artist directory listing.